Buy Clublaptop 14" Pduos B Laptop Sleeve online - Clublaptop - The largest online store by Manufacturer of Laptop Accessories and Spares. 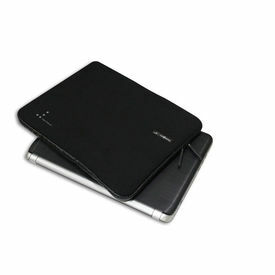 Designed for the ones who seek premium protection for their laptop, Clublaptop introduces P-Duos laptop sleeves. Made from high density Neoprene and supported by Superfine fur-like padding inside, P-duos laptop sleeve promises premium protection for Apple Mac Book, Lenovo, Dell, HP, Sony, Toshiba, LG, Acer, Asus, Samsung and many more laptops and notebooks. Large vertical zip allows ease of use while inserting and taking out your laptop from the sleeve. Featured by leather like sides with color options and two smart pullers adds beauty to its protective qualities.